Time-lapse photography can add a new dimension to the way we see things. When done well, these speeded-up videos not only help us see things in a new way but also call us to remember feelings about special places and natural wonders. On their first visit to Olympic National Park, brothers Will and Jim Pattiz captured images from various park locations for what would become a captivating video for the series “More Than Just Parks.” They traveled to some prime locations that many of us have visited, but their careful use of time-lapse equipment create a new sense of inspiration for familiar places. So find a quiet moment, sit back and enjoy their video full-screen on your computer if not your TV. One of my all-time favorite time-lapse videos was shot in Yellowstone National Park, where photographer Christopher Cauble captured the rhythms of nature in a place where geysers, streams, clouds and even the animals move with a natural fluidity. I especially like the sections where the video slows down to remind us about the normal pace of events — something not seen in most time-lapse videos. The last video on this page shows Mount Rainier in a time-lapse video by West Coast Time Lapse, a company of Nate Wetterauer and Chase Jensen. Like the Olympic National Park video, this one about Mount Rainier was posted within the past year. If you would like to see more time-lapse video of national parks, take a look at “15 time-lapse videos that capture national parks at their best” by The Wilderness Society. It contains parks from here in Washington (a different Olympic National Park video) to Maine, from Alaska to Texas. American Rivers, an environmental group, has released an inspiring new short film that captures the sense of wonder and adventure people can experience in the wild outdoors. 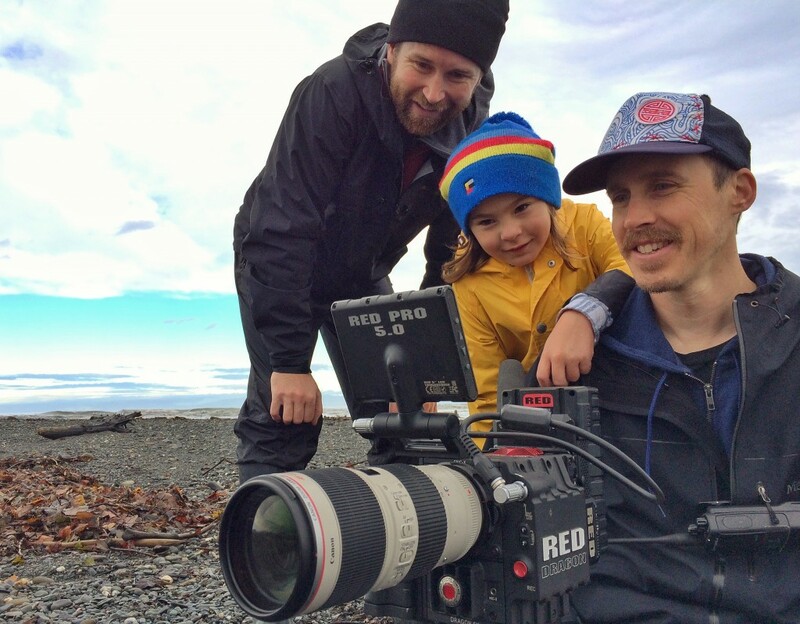 Hayden Peters, left, Parker Arneson and Skip Armstrong review footage shot at the Elwha River delta for the new American Rivers video. Skip says he got the idea for a simple film about unbridled enthusiasm and curiosity while watching his fiancee’s nephew playing on the beach. When it came time to shoot the American Rivers video, that particular boy was not available. Skip looked around his hometown of Hood River, Ore., and found an equally energetic and curious youngster named Parker Arneson, son of Emmie Purcell and Shane Arneson. This high-powered 8-year-old is an avid snowboarder and skateboarder. Skip spent three days last summer scouting out locations on the Olympic Peninsula, then came back in the fall with Parker for an eight-day shoot, traveling the Highway 101 loop around the Olympic Peninsula in a counter-clockwise direction. Being a home-schooled student, Parker did not miss any school. “We just followed Parker around when we got to locations,” Skip said. “He literally did everything else. He’s an amazing person. What struck all of us on the shoot was his ability to engage us and the camera and to come up with ideas. He’s a ton of fun to be around. “We only had one comical setback,” he said. “Hayden Peters and I set off to scout a location and got a bit lost on the way back to the van. It was pouring rain. We finally got to a hillside that looked like the road was above it, so we set off to climb the hill. Only problem was a benign-looking puddle that I stepped in with great confidence, only to sink immediately to my armpits. Parker took some pretty good falls while running around, but he always bounced back and was ready to go again, Skip said. 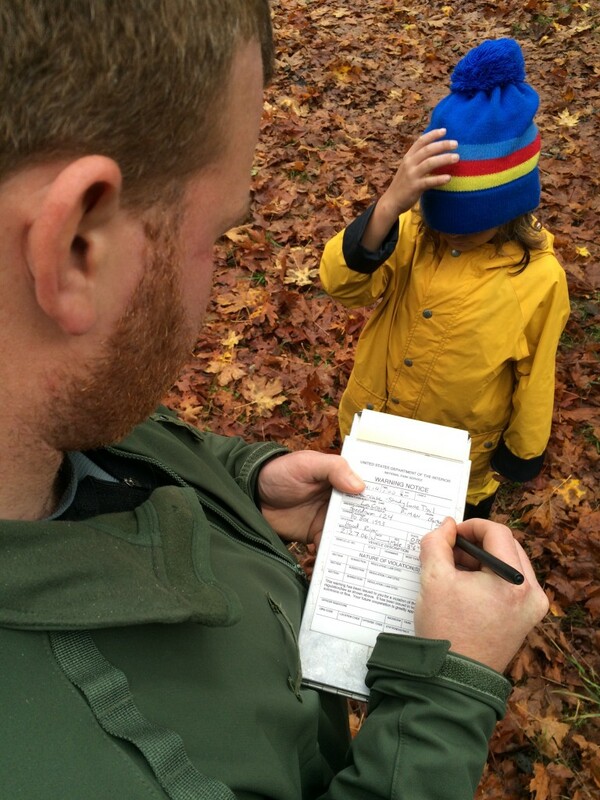 Parker shows off his speeding ticket. 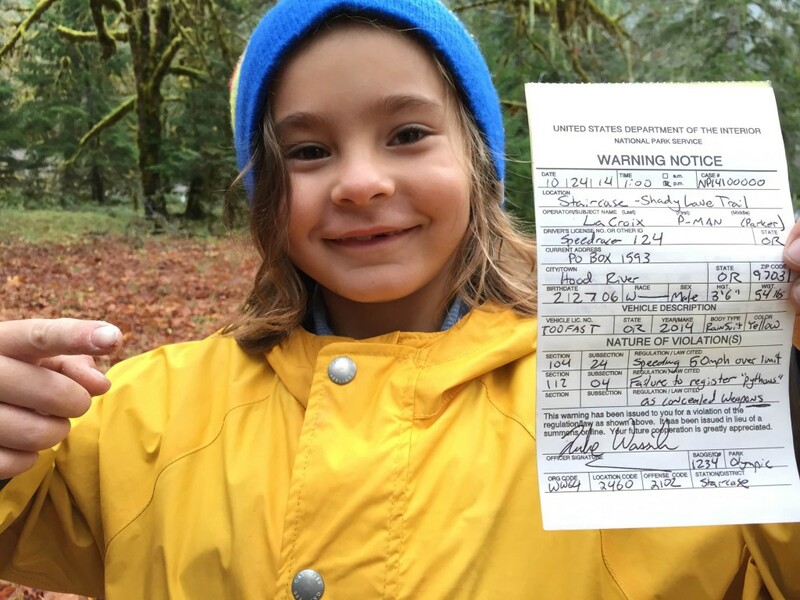 Parker even got a speeding ticket from an Olympic National Park ranger for running too fast in the Staircase area near the North Fork of the Skokomish River. It was a joke, of course. The ranger was one who accompanied the film crew as part of the permit requirements for shooting video in a wilderness area. Emmie, Parker’s mom, said he had a great time shooting the video. Skip has produced numerous films with a water theme. Check out “featured work” on his website, WazeeMotionPictures.com. He says it is important to remember the joy we feel in wild places. “To me, there is no faster access to unbridled joy than through the eyes of a young person or child,” he wrote me in an email. “It was refreshing for our team to spend so much time with Parker, and it’s cool to see audiences connect with his enthusiasm, too. Skip’s film reminds us that some of our best times can be had outdoors. As the weather improves, I’m inspired and eager to get back to some wild places with my own kids and grandkids. I also want to thank Skip for sending along the still photos that show Parker and the film crew out and about on the Olympic Peninsula. 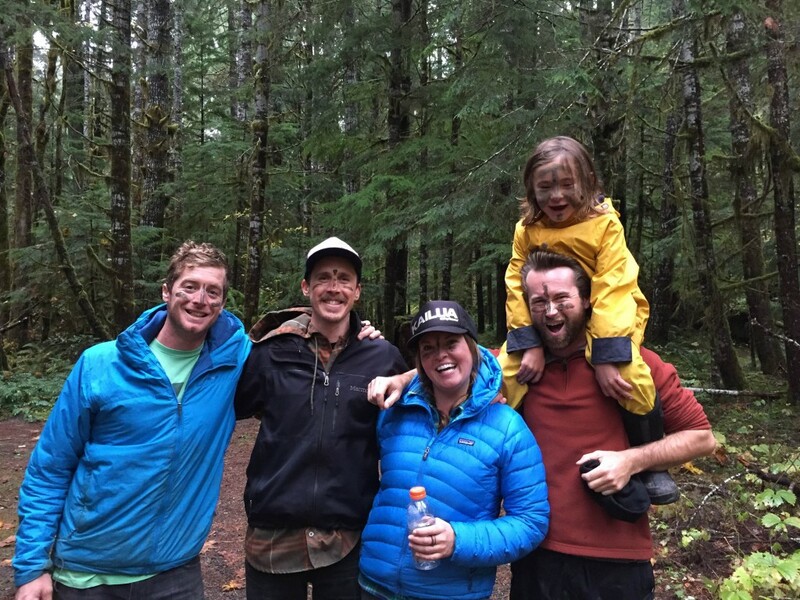 The film crew and supporters, from left, Jay Gifford, Skip Armstrong, Emmie Purcell, Hayden Peters and Parker Arneson. I believe it is important to commemorate the final day of the Glines Canyon Dam — even though only a relatively small chunk of the structure had been left in place since February, when flows in the Elwha River covered over the last 30 feet. In a massive explosion on Tuesday, that last 30 feet of concrete was blasted away. Almost immediately, the river began to flow freely, at basically the same elevation it was before the dam was built in the 1920s. Olympic National Park officials say it will take several weeks to clear away the rubble dislodged by the final blast, but dramatic changes have been taking place downstream of the former Glines Canyon Dam — the second dam on the river, built eight miles upstream of the Elwha Dam. Researchers are carefully monitoring sediment distribution and salmon migration, officials say. During the past three years, the Elwha River has experienced unusually low flows, so experts are waiting for more typical winter flows to move around some of the larger boulders in the stream. Since last fall, salmon have been swimming upstream of the Elwha Dam site. The dam, built without a fish ladder, blocked salmon migration into some 70 miles of near-pristine habitat. Now, biologists expect all five species of Northwest salmon to recolonize the river. 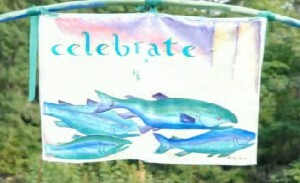 The tribe will have something special to celebrate come next July, when members hold their annual welcoming ceremony, acknowledging the return of chinook salmon to the Elwha River. When my editor, Kim Rubenstein, asked me to write a story for people who wish to check out the Elwha River restoration, it seemed like a good idea. After playing the role of tourist for a day, I’m convinced that many visitors will have a good time learning about this once-in-a-lifetime event. I wrote a story for Sunday’s Kitsap Sun that describes where you can go to see the river and various features of the restoration project. The area map we created for the newspaper can be downloaded and taken with you. Click here for map (PDF 438 kb). Learning about the natural features of the Elwha River watershed is an important part of the experience. Before you leave home, I recommend that you view a series of “webisodes” on the Olympic National Park website. I’m told these videos by Wings Over Watersheds are a sampling of what will eventually become a longer video production. A more complete story about the Elwha Restoration Project, including a history of the two dams, has been captured in a new book by Seattle Times reporter Linda Mapes. I wrote a review of her book, “Elwha: A River Reborn,” to accompany my visitor’s guide to the area. I think kids and adults alike will enjoy playing around with a model of Glines Canyon at Feiro Marine Life Center, where one can pull out the dam and watch the sediment move downstream. Randall Walz, director of education and volunteers at the center, told me about misconceptions that some people have. Many believe that the sediment in the Elwha moved downstream and piled up behind the dams, he said. Instead, most of the sediment was dropped off in the upper portion of the two reservoirs, where the water slowed down as it entered the lakes. The restoration work included digging a pilot channel through the Lake Mills delta to form a new channel and guide the river through the trapped sediment. The goal is not to move the sediment downstream as quickly as possible, Walz said, but rather to stabilize the deltas and allow them to erode over a longer period of time. If you want to see change, be sure to visit the mouth of the Elwha River, which you reach from a dike trail at the end of Place Road. Wherever you see sand, that’s change, because there was no sand here before, said Anne Shaffer of the Coastal Watershed Institute. The sandy habitat will better support the migration of juvenile salmon and provide spawning areas for sandlance, a forage fish. The decline of the rocky habitat could mean the end of tall kelp, but researchers hope the new sandy habitat will support the growth of eelgrass and a burgeoning community of diverse plants and animals. Check out the story I wrote in March, following a conference on the nearshore changes taking place. I have to say there’s not a lot of excitement to behold in the upper portions of the two reservoirs unless you remember what it was like when the lakes were in place or can visualize the enormity of the change. The river now carves its way through a dry lake bed, where one can see large old-growth stumps, which were either under water or buried by sediment. Plants are coming back, some placed there by restoration workers, others by natural processes. With or without the dams, one can enjoy the escape into this natural area, particularly as one moves into the higher trails in Olympic National Park. Be sure to take time to enjoy the natural surroundings, even if you need to cut out parts of your planned trip. If you want to observe the changes over time, I suggest you find a vantage point and take a picture during your visit. When you return the next time, take another picture for comparison. The heavy gravel and silt seems fairly inhospitable at the moment. But if you return again and again, I expect you’ll be amazed at the transformation taking place over the next few years. Changes are coming rapidly to the Elwha River, as massive amounts of sediment shift around in the river channel and flow out into the Strait of Juan de Fuca. Over the past few months, researchers have documented the formation of new beaches and the growth of the delta at the mouth of the Elwha. I described these latest changes in a story in Sunday’s Kitsap Sun. The new information came out of an annual workshop of the Elwha Nearshore Consortium, which has a special interest in the river, especially its effects on the coastal reaches along the strait. It’s exciting to hear about the transformation of the river, and I would like to congratulate the scientists for the monitoring work that allows us to talk about “before” and “after” dam removal — although the “after” part will be an ongoing story for decades. Many research organizations are involved in the Elwha, and I hope their funding holds out to tell a more complete story from a scientific perspective. Meanwhile, many writers, photographers and videographers are telling their own stories about the restoration in various ways, and new books and documentaries are on the way. I’ve talked about some of these in the past and will continue to do so as new works are released. 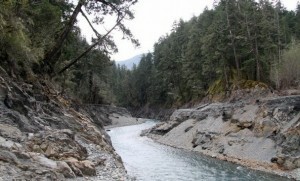 The human connections to the river, particularly those of the Lower Elwha Klallam Tribe, have been widely recognized as an integral part of the restoration story. Many Klallam elders have been gracious in sharing their culture and traditions. 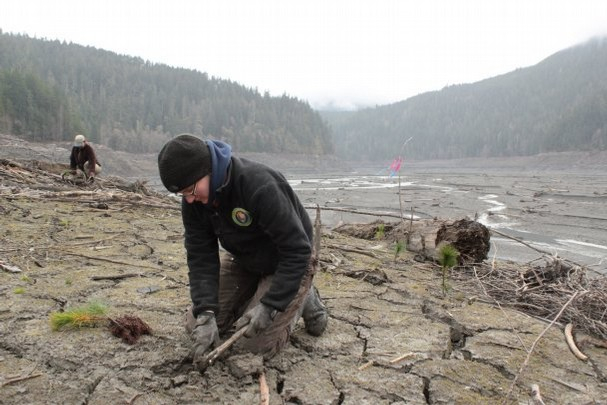 Although the Elwha Dam removal is far from the only restoration effort taking place in Western Washington, it may be the one place where nature is working at an extraordinary pace to put things back the way they were. 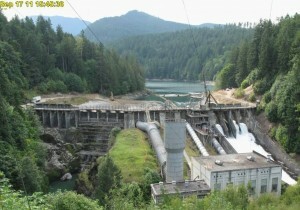 Blasting this week at Glines Canyon Dam. Click on image to start video. The “salmon window,” designed to protect migrating fish, has now closed, allowing work in the river to begin again. This week, four big blasts blew out large sections of the dam on Saturday, Monday, Tuesday and Wednesday, as the reservoir level dropped from 489 to 476 feet, according to the blog. 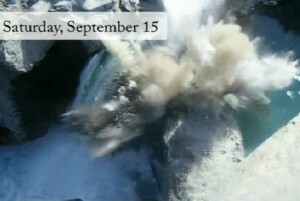 Click on the image to start the video of the blasting. After an upcoming blast on Sunday, a 14-day waiting period will begin to allow the river to erode laterally. The remote cameras at both the Elwha and Glines Canyon dams are useful for observing environmental and structural changes in the areas around the two dams. 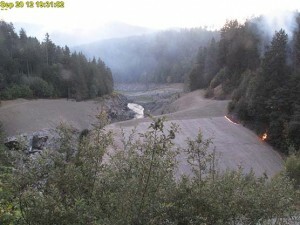 An unexpected use came into play Thursday, when an average person looking at the Elwha Dam webcam noticed a fire burning at the edge of the picture. Someone noticed a fire on the Elwha Dam webcam and was able to call in firefighters before it got out of hand. Firefighters from Clallam County, the Washington Department of Natural Resources and Olympic National Park were able to extinguish the blaze before it could burn more than half an acre. The cause of the fire is under investigation. Read the news release about fire danger in the national park. Click on image for video showing the first year of Elwha River restoration work. It’s worth noting that we have just passed the first anniversary of the start of dam removal. The Elwha Dam is gone and most site work is complete. Glines Canyon Dam is about 60 percent removed. And salmon have been observed swimming upstream of the Elwha Dam. Click on the image (lower right) to start the video, which shows what has happened over the past year. The delta and shoreline above Glines Canyon Dam provide a stunning contrast to the surrounding forest in this photo take yesterday by Tom Roorda. Work in the Elwha River stopped Aug. 1 for the “fish window,” which will halt all in-water work until Sept. 15. During this time, steps are being taken to reduce flows of sediment, which can harm migrating salmon. Salmon are being trapped downstream for transport into clearer waters above the dams. As you can see, the reservoir level has come down at Glines as more of the delta is exposed and the river seeks multiple routes on its downstream course. 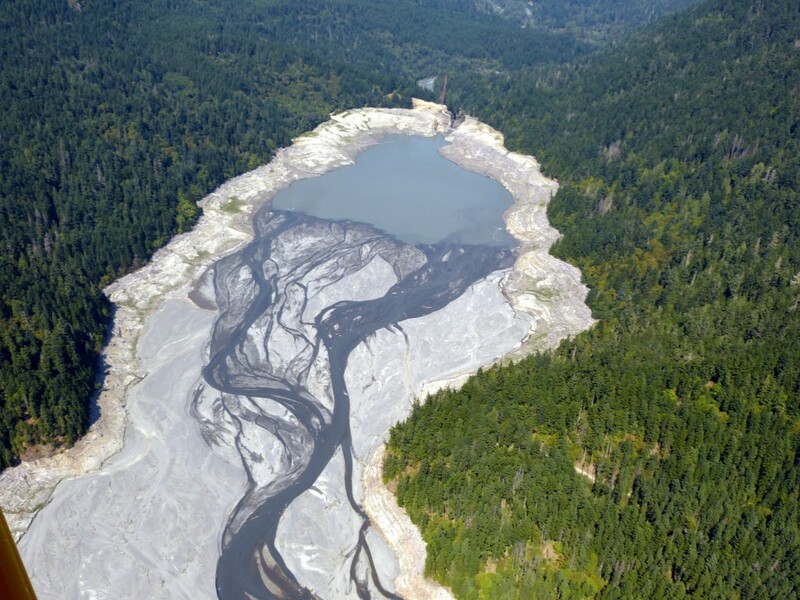 Tom Roorda, owner of Northwestern Territories, has taken aerial photos of the Elwha and Glines Canyon dams and their sediment plumes since the beginning of dam removal. Check out his website, Roorda Aerial, which contains a slideshow of some interesting and beautiful aerial photos. As we have discussed, the lower Elwha Dam has been removed and the river is flowing at historical levels. Massive amounts of sediment are moving downstream and into the Strait of Juan de Fuca. The finer sediments that have reached the Strait so far tend to disperse rather than accumulate. During the fish window, work crews at Glines are preparing to demolish the intake tower, which is no longer in the river. A blast at the base will drop the tower onto its side, allowing a jackhammer attached to an excavator to break up the concrete. In July, six controlled blasts lowered Glines Canyon Dam by 24 feet to the current elevation of 490 feet. About 90 feet of the original 210-foot-tall dam remain, according to the “Dam Removal Blog,” written Olympic National Park staff. Removal of the Elwha Dam and drawdown of Lake Aldwell behind it have gone faster than originally planned, and now the story of the Elwha River restoration becomes a story of erosion. Experts are watching the sediment movement very closely. 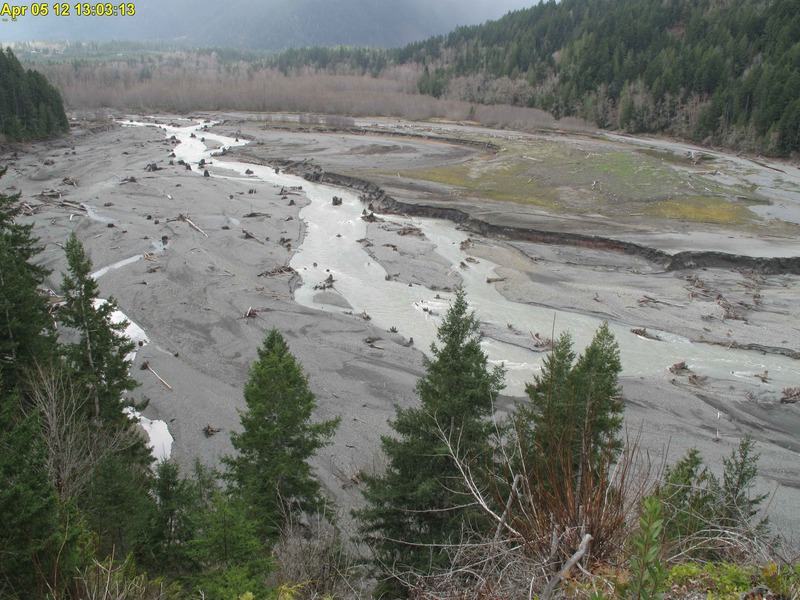 Taken today, this photo shows the sediment once impounded by the Elwha Dam but now free to move. The drawdown is on hold to allow the river to redistribute the sediment. 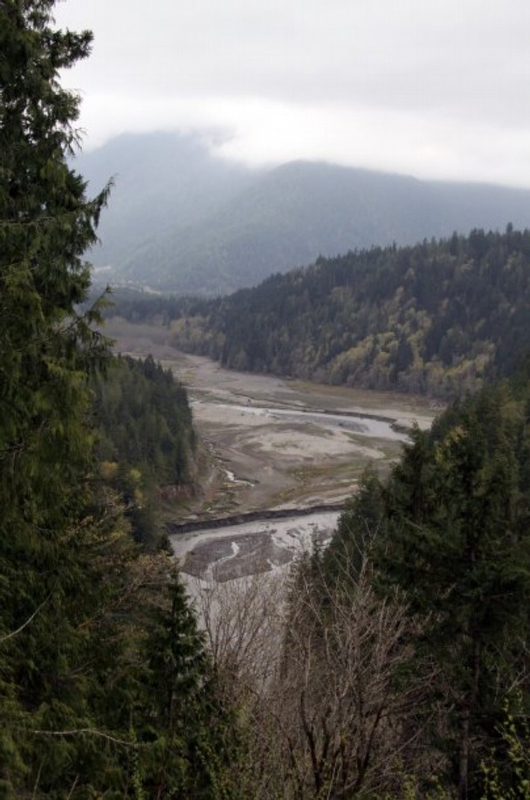 The Elwha Dam has been entirely removed down to the river bed (see photos below), and the river is now flowing in its original channel, where it will remain. The river is being held back mainly by a “check dam” of boulders. At the moment, the drawdown has been halted at 133 feet elevation for a scheduled two-week holding period. Andy Ritchie, restoration project hydrologist with Olympic National Park, says the pause in drawdown will allow the river to snake around to redistribute the sediment more evenly across the valley. The final target elevation for the river bed is 100 feet. Drawdown of Lake Mills, behind the upper Glines Canyon Dam, also is on hold at the moment. Even more sediment is trapped behind that dam. While project managers have largely lost control over the movement of sediment behind the lower dam, the upper dam remains intact enough to control migration of sediment from farther up the canyon. As the weather improves this spring (or at least we can hope), it may be time for many of us to visit the former lake beds at the two dams. We can walk out onto the deltas and see the new vegetation starting to grow. Lake Aldwell’s delta can be reached from the old boat launch. For Lake Mills, take Whiskey Bend Road, which has been reopened, and you will come to Humes Ranch trailhead with access from there. Work resumed yesterday on the Elwha Dam site after biologists determined that the annual chum salmon migration had ended. The work originally was to be delayed until Jan. 1. Work in and near the river stopped on Nov. 1 to protect fish runs from heavy sediment, as scheduled in a work plan adopted several years ago. Three work stoppages — known as fish windows — are planned each year. Adult chum salmon were captured as they returned and were transferred to the fish hatchery operated by the Lower Elwha Klallam Tribe, according to a news release from Olympic National Park. Offspring of those chum will be released into the river in the spring. It’s been awhile since I posted photos from the demolition site. As you can see from the pictures on this page, the change since mid-September is dramatic. Most of the Elwha Dam powerhouse has been removed, and work is scheduled for completion at the end of this month, according to the park’s Dam Removal Blog. Materials from the old power plant are being recycled. All the old power lines and poles associated with Elwha and Glines Canyon dams have been removed. The 120-foot-tall surge tower was pushed over Thursday. The river was diverted back into the right channel yesterday, as water levels behind the dam continue to go down. Revegetation of the two reservoir areas started in November and continued into December with the planting of about 12,000 plants. Another 18,000 plants are planned for January and February. 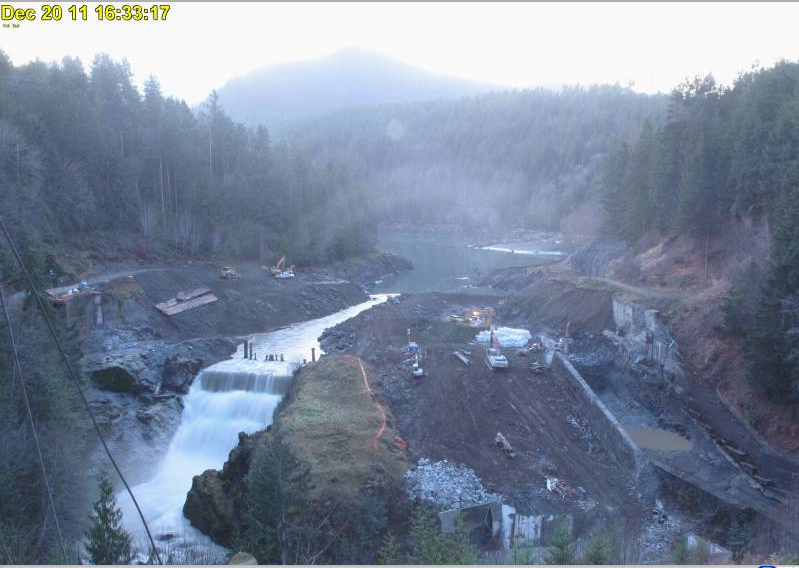 If you’d like to watch the entire demolition of either dam to date, go to the Elwha River Restoration Project webcams and click on “Java” for any of the cameras. The fastest way to watch the entire time-lapse series is by putting the delay on 0.